The Stainless Steel & Acrylic Soap Foamer is a unique non-aerosol 12 ounce unbreakable counter top soap dispenser. With only a small measure of Liquid Pure Soap Concentrate the Stainless Steel & Acrylic Soap Foamer instantly creates like a miracle a rich, thick foam, for all gentle hand washing, general cleansing and the safe lather foam washing of fruit and vegetables. Never before has this little touch of luxury been offered to the consumer. Ideal for every sink in the home. It is a medical fact that washing your hands frequently prevents the spread of infectious diseases. Lathering up with pure soap and water rinses away 95% of harmful bacteria. Created exclusively for the Stainless Steel & Acrylic Soap Foamer. 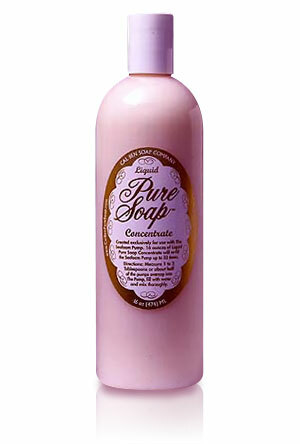 Liquid Pure Soap Concentrate is 100% active. Add a half ounce of soap to the pump and fill the rest with water and shake well. The Stainless Steel & Acrylic Soap Foamer will make over 300 generous foam portions. The 16-ounce bottle of Liquid Pure Soap will re-fill the Foam Pump up to 32 times, that's equal to 9600 hand washes or at least a year's supply. 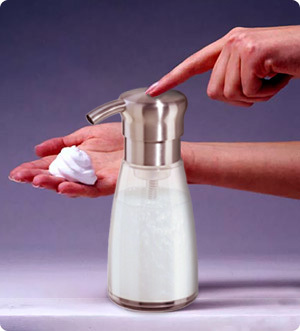 The Seafoam Finger Pump is a unique non-aerosol 8 ounce unbreakable counter top soap dispenser. 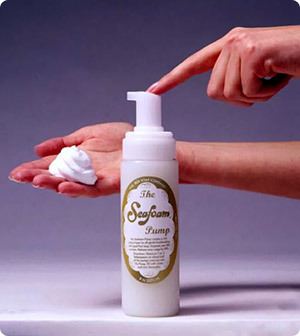 With only a small measure of Liquid Pure Soap Concentrate the Seafoam Finger Pump instantly creates like a miracle a rich, thick foam, for all gentle hand washing, general cleansing and the safe lather foam washing of fruit and vegetables.